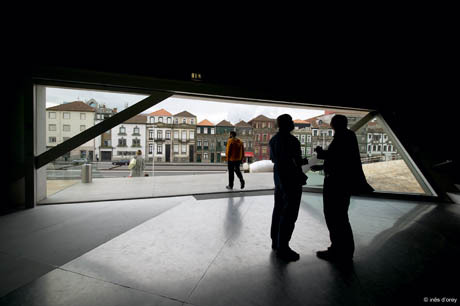 For many years, new noticeable objects in the urban landscape of Porto have been ruled by consumerism, with shopping malls and speculative housing complexes, and by the established codes of the Porto School, with Álvaro Siza as the foreman. The new millennium starts with Koolhaas’ appearance shaking things up. A diamond-shaped white concrete Casa da Música [CdM] slowly emerged in the most central roundabout of the local modern urbanity. From the very beginning, the process was politically and urban disturbed. This fact placed its construction, architecture and meaning in the foreground of discussion of citizens, architects and national newspapers. Early April the international press had a presentation and tour through the CdM. Koolhaas arrived proudly into the fully glazed lap-foyer on the rear top of the large auditorium. Even those who do not know him in person had an impression of 'this-is-the-man'. Yes, it had to be him. Even among the whole technical and managing team and a bunch of journalists, coming from the four corners of the world, there is an advantage Rem Koolhaas has: his stature, his way of easily getting above every other, his convincing yet not-always-so-orthodox manner of substantiating OMA's work, options and solutions. He went on telling the very same heroic story he's been spreading in the last few years throughout all sorts of architectural audiences. All the features in CdM caused general astonishment that could only grew bigger during the 2 hours of true promenade architecturale conducted by Koolhaas and his entourage through the building. Designing a building that was already named House of Music made OMA be naively literal: this concert hall has actual windows like houses do. Their extravagant scale fits the bigness of the building. Only being inside one realise their size. The same goes for the building. From the outside it does not look enormous, but the 23.000m² have indeed to be in there. There was a meticulous concern with the existing city. It defies the lack of scale of its surroundings, however because the footprint is so small it integrates very well with what is around. Openings, accesses and forced views to the exterior brought wasteland back into the city with a re-invented urban meaning. The lack of colour of the exterior is to make it absorb the chromatic range of the urban setting. The yellowish brownness of the travertine feels like an extension of the pavement of the facing park. OMA was keen in using materials and facilities with regional availability, and the furniture for instance is mainly from Portuguese designers from the 1970s and 80s. The local importance of Siza's and Souto Moura's aesthetic preferences made the design team integrate them in CdM, Koolhaas assures. Therefore and unexpectedly Rem went contextual in Porto. Starring in the city life and built environment, CdM aspires to be an icon. From further distance, with an extreme expression, it prompts in Porto landscape. 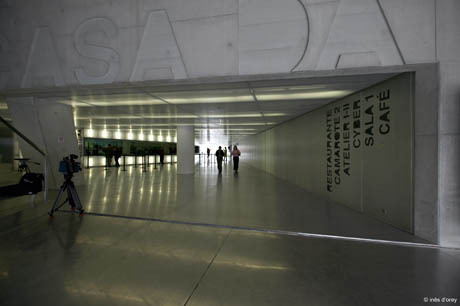 Yet, in Rotunda da Boavista, despite the scale of the building it is camouflaged by the dense and tall trees that fill the busy roundabout where it sits. It is only possible to understand its grandness by spending time inside experiencing the variety of spaces, circuits and atmospheres. 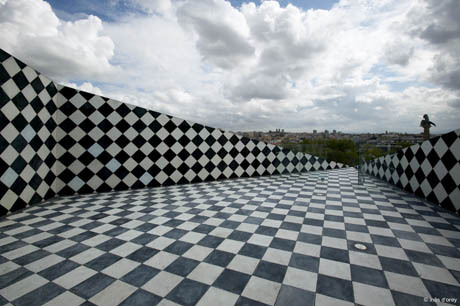 CdM has the endowment of transforming the ugly and not kept urbanisation around the building into beautifully framed snapshots; or, from the checkerboard-terrace carved out of the concrete roof plane, into a fictional cityscape. Oddly reality remains inside. In delirium. 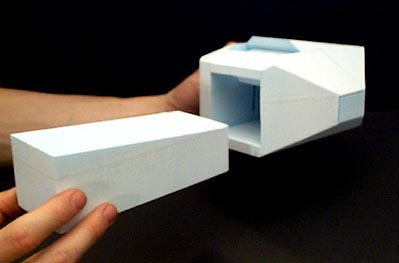 The building design departed from the definition of the 2 auditoriums that can be perceived from the outside. Nevertheless it is not possible to have a clear notion of where they stand inside. All the leftover space was worked out and transformed into the different functions required in the program. A sea of types and typologies sorts out variations on morphology, materialisation, sensibility, provocation and technical experiments. A creatively and intelligently designed circuit connects them, spinning through the different scenes of the building. 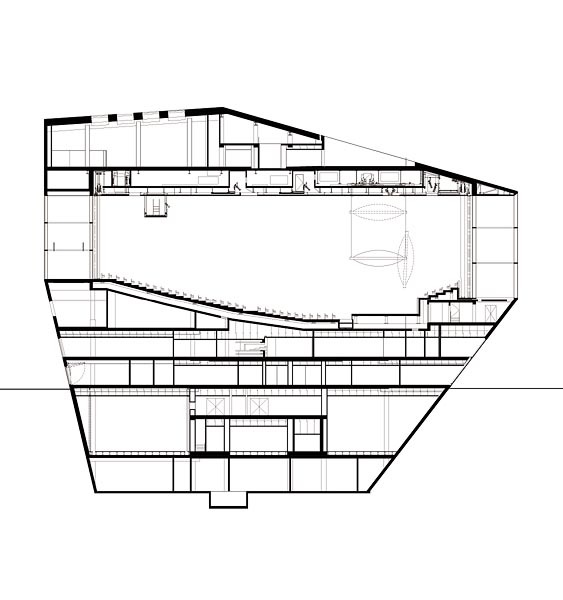 During the design process, many extra spaces were created and given use and meaning: the bar floating in the space next to the huge rear window of the large auditorium; the terrace in wide landings on the way to the restaurant with a view to the main entrance, and a big roof window facing the sky. There is not a lobby space in the sense of the foyer but rather processional spaces either embracing the functional areas or becoming part of them. There are capricious staircases, angular spaces disappearing in a further spot, narrow tunnels with ramps or escalators leading to the next surprising location. The route is not clear; suddenly there is a cross view to the main auditorium; another bit of city framed just ahead; a chamber orchestra in one of the rehearsal rooms; a pop-star conferencing for the press in the VIP room. The austere looks of external materials were compensated in the interiors by a panoply of colour and texture. 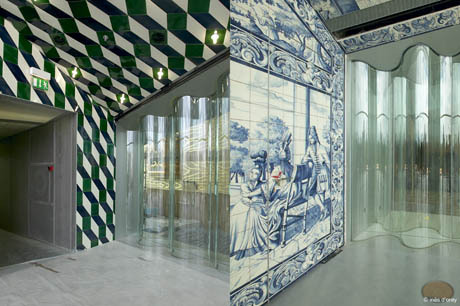 OMA was amazed with the fact that one can still find hand-manufactured materials of classic/traditional Portuguese architecture, like XVIII and late XIX century tiles or the gold-filigree (used in the rough plywood panels cladding the large auditorium). They were revisited and given a contemporary use. Different sorts of ionised and aluminium plates clad circulation floors and walls hybridising horizontal and vertical planes. Natural and artificial light and views are spread in the interiors not only as function but as decoration as well. Petra Blaisse developed curtains without use of colour, in order to invite reflection of colour from the interior (the golden red walls, the public and the stage) or from the exterior (the sun, the trees, daylight). The curtain's emphasis lies in their scale, openness, form, movement, grade of transparency and acoustic absorbency levels. Koolhaas referred that in the building nothing is entirely visual, everything is integrated as part of the way the building works; then becomes aesthetic. After six months of tests, the colour and texture of the slanted concrete walls was reached by mixing Portuguese portland-cement with a particular blue sandstone that will whiten in time. Oblique planes that are defined by the contour lines of the two auditoriums give the shape of the outer shell. This shell is the main load carrying stability system; it is suspended by two 1 meter thick walls and simultaneously shoved from them by pillars that prompt occasionally in the diverse inner spaces like episodes – as Arup's Cecil Balmond put it -, like willing to say something. 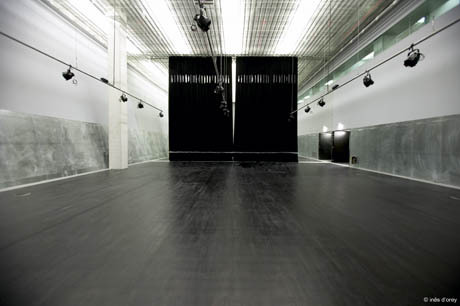 Those very thick walls enclose the long sides of the large auditorium; from them it hangs as a completely separate and isolate structure for acoustic reasons. The shoebox shaped large auditorium was taken for being the most efficient and reliable, as prove the considered acoustically best concert halls in the world. The two immense glass walls (windows from the outside) were then the challenge. Renz van Luxemburg (from Dorsser Blesgraaf – Acoustics) believes there is a relationship between how the space sounds and how the space looks. Therefore, together with OMA, structural corrugated glass panels were developed to reverberate sound into the lateral walls, which, above the stage zone, kick it down to the public. 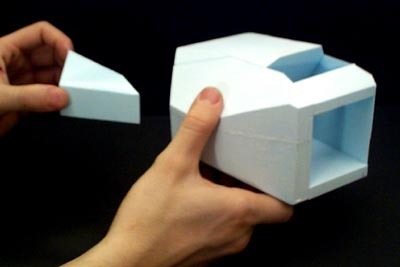 At the same time they solve aesthetical and structural issues. 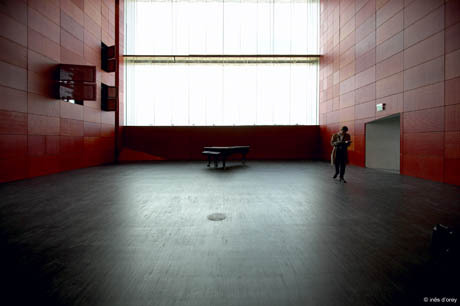 Acoustics is claimed to be close to Amsterdam's, Boston's or Vienna's concert halls. 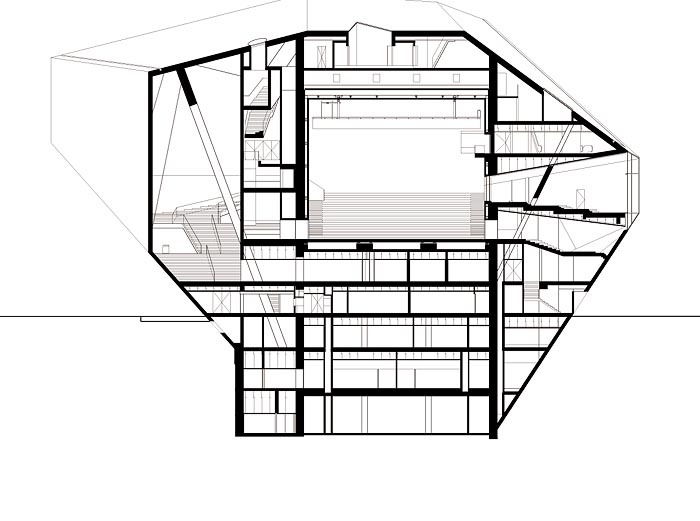 The concept of CdM was developed for a single family house whose dwellers-to-be were very peculiar in their demands. 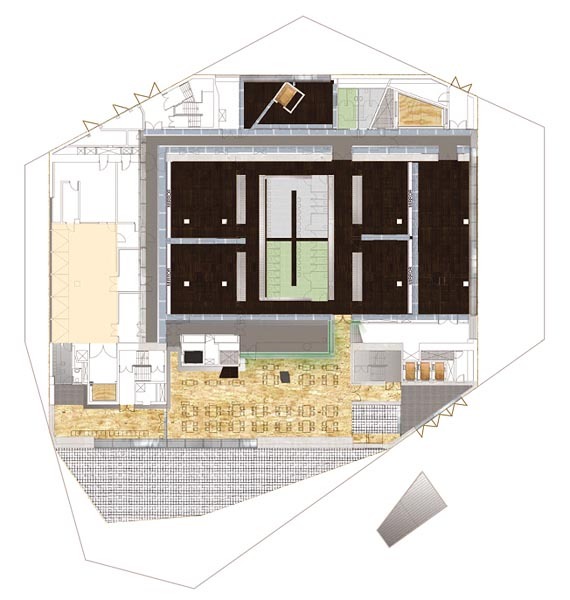 OMA suggested a villa which main principles were the co-existence under one roof of a series of open yet isolated spaces for each member of the family. These would eventually allow seeing through in specific spots and only meet physically in one big central area thought as a long wide tunnel. Two weeks before handing in the Porto project, Koolhaas realised that applying these issues to the concert hall would match and satisfy two of the main requirements of the competition: (1) the CdM should be open to the public most of the time rather than only during shows, being a live infrastructure attracting public through its architecture; (2) CdM should demystify the activities of professional musicians, stimulating a closer relationship between public and artists. Working in Portugal, Koolhaas hit the target: he achieved personal goals by following the program and not by re-inventing it. The villa was scaled up 5 times and inserted in a wide-open travertine plateau. 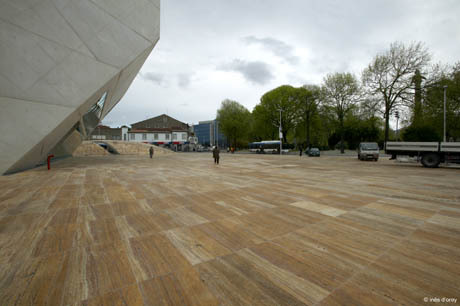 This plaza broke with the solidly structured city fabric, setting up a new décor for that part of Porto by bringing together issues of visibility, accessibility, functionality, meaning, experience and, in a more extensively way, urban morphology and logistics.